I'm going to talk about something that is very important to me. It is so important to me, that I am not going to use the expandable post feature on this, because I want the whole post to show. Please forgive me now, because I WILL ramble in this post. I am going to tell you a few stories (and probably cry while I type them), and you will have an insight to my life, the support that helped me survive, and the most important person in my life. My grandparents raised me since the age of two. I've told you that before. My grandmother was the most amazing woman that I have ever had the opportunity to know. She got more done in a day than I, as an adult now, can get done in a week. She had this love, this all encompassing love that she showered over six children (seven if you count me) and twelve grandchildren. She knew what each family member's favorite meal or dessert was, and it was always waiting for you when you walked in her home. As much as she was full of love, she was also full of strength. She nursed us when we were injured or sick. She disciplined us, even when she was holding back a smile. And, she provided an example for all of us, not just the women, but also the men. She provided so many lessons that we needed to learn while growing up, and she provided an example for us to strive towards as a spouse, a family member, and a parent. If you haven't figured it out by now, my grandmother was a very special woman. She was my mom; she was my hero; she was my saving grace; she was my protector; she was my supporter and my encourager; she was my WORLD. There is only one time that I ever questioned my faith, and it involved her. No, it was not because of her. She made sure that I was an active participant in my church and learned my bible studies. You see, as a young child, I remember when Grandma went to visit a card-club friend of hers at a nursing home. This friend had become a victim of Alzheimer's Disease. I waited anxiously for my grandma to come home from visiting her friend. When she got home, I excitedly ran to her, wrapped my arms around her, and asked "Grandma, how is she?" I remember at that point, my grandmother sat down on her bed, looked at me and said "Misty Dawn" (that's what she always called me when she was serious) "That is a very sad disease, and I pray that, no matter what happens to me, I pray that I never get that disease." As a child, hearing Grandma confide that to me, didn't really hit home. It didn't hit home until I sat at the nursing home, next to my grandma's bed, holding her hand, telling her stories, and wondering how much she was really understanding of what I said. That was the only thing that ever made me question my faith. However, I didn't question long, because I knew that the same woman stricken by this horrible condition, the woman for whom I would give anything to take this stupid disease out of, that woman would tell me to continue believing, continue with my faith, and to realize that there is a reason for everything. Now, I'm going to tell you about a love, a love so strong that nothing could take it away. 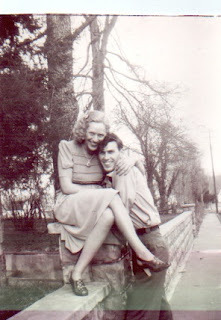 My grandmother's father did not talk to her for eight years, because she married my grandpa. They had their first child, before he chose to talk to her again. He thought that my grandpa wasn't good enough for my grandma, because Grandpa did physical labor for a living. My Grandma's father made the comment, "He won't even be able to keep you in stockings. ", because back that, pantyhose were not easy to come by. My grandmother had been in the nursing home for over eight years, and my grandfather was still ordering pantyhose from the company that he had signed her up for when they first got married. Every day, he drove to that nursing home to be with her. He became a fixture in the home. Everyone knew Jim, and people would make a point to come in to sit and talk with him. When his heart problems got too bad, he became restricted to a wheel chair, and his daily visits to the nursing home had to stop. You might as well have killed the man. His wife, and his dedication to his wife, was what made him who he was. On my Grandpa's last Christmas with us, we were given the greatest holiday gift that anyone could ever be given. There was a very special nurse at the nursing home. His name was also Jim. Jim got up on Christmas morning, went to the home, dressed my grandma in her Christmas sweatshirt and a Santa hat, loaded her and her wheelchair into the van, and brought my grandma to my grandfather. When he wheeled her into the room and my grandpa saw her, there wasn't a dry eye in the house. In fact, I'm bawling right now. Jim, that wonderful man, gave up his Holiday day off to do this for my grandfather and for us. I love that man for his caring and his generosity, and I know that God was using him as an angel for us. This same wonderful man brought my grandma to the funeral home for her husband's calling hours. Even if she didn't realize what was happening, he still did so much for us as a family. This disease has had a huge effect on our entire family, because it affected the person who had the biggest effect on our family. When one of my younger cousins got married, she contributed to The Alzheimer's Foundation in each of our names and in memory of our grandma. That was her gift to us, and it was a very beautiful gift. November is Alzheimer's Awareness Month. Please, learn all that you can, hug your loved ones, take photos, write down your memories and stories, participate in the search for a cure and participate in memory screening. Please go here to learn more about memory screening for early detection and to read some successful aging tips. Wow, what a powerful memory you have of her and a wonderful tribute to your grandmother. A beautiful retelling, Misty. Wow, that was an amazing story. You have me crying! Your grandparents were such wonderful people. I can tell that you loved them very much. Thank you for sharing this with us. It really means a lot to me. thanks for giving us a little look into you and who you are. It is a truly horrible disease. Much more so for the ones not afflicted with it, I think. It really scares me. I'm so sorry your family had to suffer with it. But, what amazing love stories you have to tell. And it sounds like that is what you focus on the most. As you should. Thanks for sharing, Misty Dawn. Misty Dawn, my dear friend, I know what its like because my grandmother suffered too of that dreadful disease. I was 17 when she was first stricken, the family asked me to go live with her since I was close to her my whole life, my grandmother raised me with my mom, so I had a very close relationship with her. She suffered from the disease for 10 long years before she died in 1993, 6 hours before her birthday. There's a long story involved about her life and one day I'd love to share it with you. What a a beautiful story. And what beautiful men -- both Jims. Thank you for sharing this touching story. Alzheimer's Disease is such a heartbreaking condition because it steals memories and deteriorates the mind. My husband's father has Alzheimer's and I've seen how his condition deteriorated. It's sad to see someone so intelligent and full of life slowly lose his memory until it is void of significant memories. What a truly beautiful post. Brought tears to my eyes reading it. I have an aunt right now who is suffering from Alzheimer's. Last year her husband was forced to put her in a nursing home too. Beautiful post. Unfortunaley, Alzheimer's runs in my family. I'm doing everything I can to keep my brain sharp. Being a writer and scrapbooker, you can bet I'm keeping track of all our memories! Misty, you have me in tears. Your grandparents sound so wonderful, and I can tell your grandma was a strong and very special woman. Mine was too, and it was very sad to see her deteriorate with Alzheimer's. It's a horrible disease that takes away all the best parts of our loved ones -- all but our own memories of them. May we all remember our loved ones at their best, rather than at their last, and be thankful for the blessing of having known and been loved by them. I knew a very special woman who had Alzheimer's that sounds very similar to your grandmother. Your post made me think of her and I cried right along with you. Thank you for sharing this. Wonderful post Misty. My mother suffers from Lewy body Dementia (a variant of Alzheimer's) herself. Its a terrible disease that ravages. I hope someday they find a cure. That was brave of you to post such a deep and personal story. It was well done and I hope brings people to open up and contribute to any foundation that supports Alzheimer research. Wow. That was a beautiful post. Thank you for sharing. I've been fortunate that no one I know has had to deal with this awful disease. For some reason I can't explain, I'm terrified of the thought of it. I've told my sweet Poor Hubby that I'd rather die than exist not even knowing who I am. I know, however, that he will be just as dedicated to me as your grandfather was to your grandmother, should it happen to me. Silly boy's already made up his mind. Sounds like your grandpa was a very special man, too. Oh that was just a beautiful story. You did a great job, although I'm sure it was hard, describing the love in your heart for your grandmother. I have tears in my eyes too! This was truly a wonderful post and if Google took exception to you having two paid links in it then shame, shame, shame on them. You wrote from the heart, you wrote of things that were important to you, and the paid links were irrelevant. Kudos to you for this! Thank you so much for visiting my post on this subject. I did get your email the other day and just hadn't gotten a chance to come by yet. Yes, this is a real problem and the more I can do to help the better. I have first hand experiences with such patients both professionally and in my family. It's tragic so I was more than pleased to write it. It's one of those posts you can go on and on and on about! I am sorry to say my grandmother suffered from this as well. She kept calling me by my mom's name and it broke my heart. She had nick names for me all along until then. Then I was not me at all. I didn't exist yet in her mind. Heartbreaking, so sad, so real, so painful. Great post, I hope they find a cure or something!